So there I was, stepping off a plane, sweaty and tired after over ten hours in a cramped metal container. I must have looked ridiculous with three sweatshirts, a couple pairs of pants, and two of my summer dresses. My suitcase had been stuffed full and I had been afraid any bit of fabric would send it over the weight limit. I probably shouldn't have worried because in reality, my near to bursting bag was only 21 kg or so. But no matter, there I was, almost dying when I stepped off a plane and onto American soil; or more specifically, onto Texas soil. I wasn't home quite yet. However, Texas was my first taste of America after not being in the "land of the free" for over four months; it was completely overwhelming. I could now listen in to any conversation I wanted. People put way too many things on my plate that had touched a deep fryer or had been smothered in butter. Voices were loud. Cars were huge. It was just so much. Throughout the next couple days things would get even stranger. I eventually left Texas, early in the morning, and came to the land of Iowa where the humidity and heat wasn't yet quite overwhelming. What was strange, however, was how much the city I had once loved had changed. The streets were too wide. Buildings were too close together. The trees didn't have that pretty pattern that spirals around on those trees in aix. And where was all the cigarette smoke? And the funny looking outlets and plugs? And, course I miss those Pain au Chocolates. I went to a coffee shop and ordered a Chai Latte. That was my favorite drink. I could once drink it in two seconds. Now, I could barely drink half of it. The glass seemed taller than my head. And the black bean burger and fries from my favorite burger place that I had been looking forward to for about four months? It filled me up and made my stomach feel funny. The next day I made a Salade Nicoise. That was much better. That in itself, seemed to be now, a little taste of what had become my home. Here the buildings turn and twist, ocean waves of architecture against the clouds in the sky. They are streaked with colors brought directly out of a dream. Never in my life had I known a place could look like this; just like wonderland. But this is Barcelona and it feels like anything is possible. Before a few of my friends from camp told me that they were going to be in Barcelona and it would be a perfect weekend to meet up, I really knew nothing about this city other than what I had seen as a twelve-year-old watching Cheetah Girls on Disney channel. I was enlightened to its greatness soon enough. Around ten at night, I took my backpack and stepped onto a bus at the Gare Routiere. The next morning I was at Barcelona’s North train station, wondering just which way was south west. Eventually I figured it out and made it to my hostel. There Monica was waiting for me. AHHHHHHHH. We were so excited to see each other, and of course spend a good portion of the day talking about camp. We also wandered the streets of this beautiful city, which were both ancient and modern pressed together. It was rainy, but people were out and about. We took a tour and learned about the history of Barcelona. We took a cooking class and learned how to make a Paella and Sangria. I had tapas for the first time. I was awestruck by a building. I drank some freshly squeezed juice made from a fruit I had never heard of before. The second day Monica and I met up with yet another camp friend. It was great to be in Barcelona, halfway around the world, so far from where we had started. Welly, Monica and I together in a place so much different than Camp Foster. Although it was hard to say which place was more beautiful. Barcelona with its bright Goudy Architecture and giant food markets does come close to being as beautiful as that one lake in Western Iowa that has been my home for so many summers. Barcelona, of course, though, was much different from that familiar spot at camp. Yet, eating churros and laughing about stories of ours, I got a little taste of home and it was absolutely wonderful. This is my life here. Marchutz is a little building on top of a hill. To get there, you climb a little path which is nearly always wet and covered in puddles. You get to the top with mud coated boots and a little short of breath which reminds you that you are out of shape and perhaps need to lay off the croissants. In fact you have one in your bag for when you get hungry in class. And it’s such a long class too. Painting, drawing, seminar- whatever, all takes place in this building where the turpentine fumes are already seeping into your brain, making you feel like Alice in Wonderland. The talking caterpillar in the corner agrees. Wait, that’s just the turpentine at work. So far in this place, I have gotten a lot of drawing of a naked girl, a few paintings that I don’t want to claim as my own, a few that I probably will claim, and a crap ton of doodles in my notebook. Springtime in Provence so far has been marked by beautiful flower petals always falling on my head, the opening of ice cream places (which I may have already eaten quite a few times), and a school wide trip to the Luberon region of France. This past Friday morning, about a hundred college students gathered in front of the Cezanne Statue, which is the standard meeting place for anything and everything. The place where we were heading for the day wasn't too far away, though I can't tell exactly how long the bus ride was because-as always- I fell right asleep as soon as the bus hit the highway. When the two busses stopped and I work up, we were at a small village whose name I can't quite pronounce, no matter how much I try. Throughout the day we visited a total of three little villages. For lunch, we stopped at this incredible little village where we loaded up on food from the market. About an hour later, we carried our newfound loot (for me it was strawberries, bread, cheese, and tomato spread) and proceeded to travel to another splendid little town situated on a hill. On the top of the hill there was a plateau with a green lawn and a few beautiful sculptures. Here, we spread out and ate our little feast. It was a beautiful day and a picnic was perfect. I then spent some time just chilling in this tree, because of course I'm a monkey and/or wanting to be Rue from the Hunger Games. We also went to this place where ochre comes from. As a painter, I could really appreciate that. I wanted to take the ochre dirt and put it in a jar (and shout I have a jar of dirt in the style of Captain Jack Sparrow) and then I would have it to make paint for whenever I needed ochre. But of course I didn't because I didn't have a jar and I don't know how to make paint. 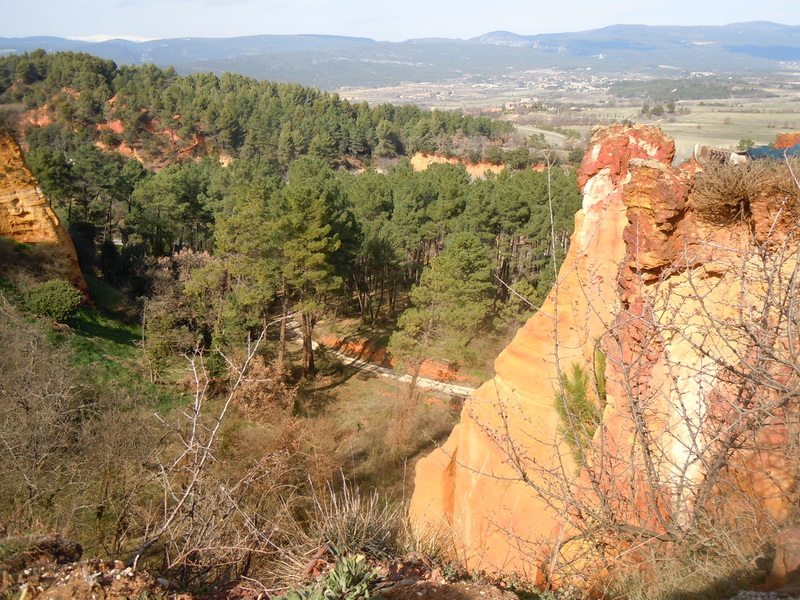 I did however do a lot of hiking and, when I got back to Aix at the end of the day, my boots where coated in a beautiful layer of ochre. It was in the afternoon that we arrived in Dublin, tired and smelly from a day in another one of those flying pieces of metal most people call airplanes. The three of us stepped from that tarmac, smiling widely. I still can’t believe we’re here. We said pretty much the same thing over and over for the next hour or two or hundred. But we couldn’t help it. We were excited. The first thing we did was find our hostel. The second was to find a pub, you know; the kind that Ireland is famous for. The next day we took a bus across the country to Galway. It was a two hour bus ride and I was so excited to see the Irish countryside. It was supposed to be beautiful I had heard; green fields, rolling hills. Unfortunately I have this habit of falling asleep so all I really did see was the inside of my eyelids and my dreams about hobbits and video games (yes I have weird dreams). 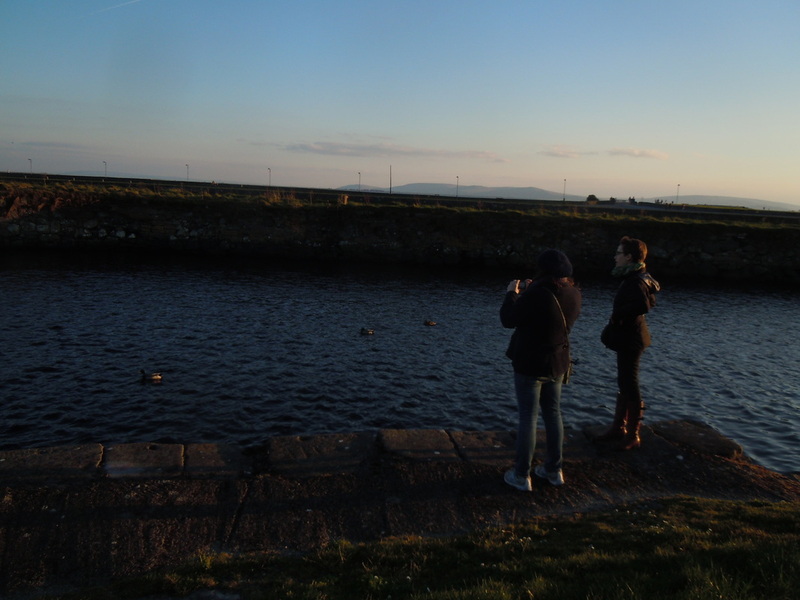 Galway, however, was beautiful. Almost as soon as we arrived, we knew that we wanted to spend pretty much forever there. We didn’t exactly have forever, however, but we were able to add an extra day there, taking away one of the days we were supposed to spend in Dublin. There we spent three wonderful days. That was my favorite day pretty much of my entire life. Words cannot describe the beauty of the cliffs. Neither can pictures; but I’ll put one here anyways. This day especially I spent scheming ways that I could stay there forever. 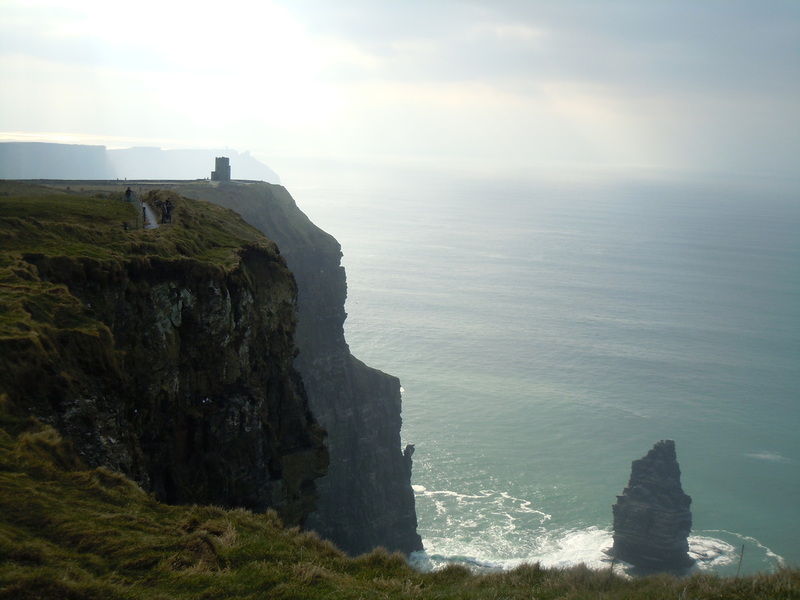 I could move to Ireland and never look back. Sadly, however, the trip had to come to an end. One late morning, we loaded our suitcases on another bus and watched the countryside roll along through the smudged up windows. This time, listening to Bon Iver, I stayed awake for a good deal of the trip. We arrived once again in Dublin. Two more days that was all we had left. we spent those days wandering around, drinking cider, and going to Trinity College and the Jameson Factory. Those too passed by too quickly. Early Friday morning we were all packed, our suitcases slightly smelling of dirty clothes and our passports and plane tickets all ready to go. I’ve been here in Aix for about a month now; a fact that is still so hard to believe. This is a city that is over two thousand years old where basements often look like caves, trees are covered in polka-dotted fabric, and you can buy really anything that your heart desires in outdoor markets. It really is an incredible place. The first few days that I was here in Aix, I stuffed myself with way too many pain au chocolates and cheese and spent hours wandering around the city marveling at the extravagant fountains and architecture (and more often the shoe stores); but now, I’ve since somewhat settled down from that initial shocking overload of French cuisine and culture. Life is starting to feel more real and more normal. I’m starting to really believe that I’m actually here and will be in this place for the next three months. The plane has been delayed. The woman’s voice announced, loud and echoing through the Des Moines airport. It will be another hour or so. This delay would give me only about ten minutes to cross through a large chunk of Chicago’s O’Hare. We can put you on another flight. They told me. But it won’t be until tomorrow. I’d wait until I landed in Chicago, I decided. Maybe the airplane would fly especially fast. Maybe I would get there with plenty of time. My watch said 9:35 when the wheels hit the runway. My departure from Chicago was also at 9:35. I was panicking. In my head I was running through possibilities. Maybe the other plane has been delayed. Maybe I could stay with my brother who lives in Chicago. I didn’t know how far he was from the airport. Maybe I should start running. I swung my backpack over my shoulders, grabbed my other bag, and tried to move as fast as I could; which isn’t that easy when there is a herd of people pushing out of the same tiny space at the same time. And when you are in a hurry, people always seem to move much slower. It’s annoying. But eventually I broke free from the crowd and started running like a crazy person. You never realize just how out of shape you really are until you are sprinting your way through a busy airport; trying to weave around people as two heavy bags hit your back and sides repeatedly, probably leaving bruises. Please, please, please. I chanted to myself as I passed various gates. H16. H17. K1. K2. In the distance was K15, the one that I needed. 9:45, my watch said. I was doomed. But some days miracles do happen. That was one of those days. I arrived, gasping for breath, at my gate. A woman in a dark uniform stood in front of it. Still not breathing quite right, I handed that little leather-bound booklet to her. She smiled, handed it back to me. Now I’m on the plane. There is a man sitting next to me whose accent I can barely understand. He is going to Kuwait. I sit in the aisle seat where the carts that go by almost hit my elbows each time. They bring me pasta and water. The pasta is pretty good as far as airplane fare goes. I try to get comfortable, but I really can’t. I can never get comfortable on planes. They play a movie with Joseph Gordon Levitt. I don’t know what it’s called and I can’t hear it but I enjoy looking whenever he is on screen. Sometime around midnight I drift off but I wake up about an hour after that. I turn my music on and Taylor Swift sings to me. I try to go back to sleep but it’s no good so I let T Swift sing some more. Where are you going? The man going to Kuwait asks in broken English. France, I say. I’m going to France. I sit, with my back pressed against the couch, as Pandora’s station of summer hits of the 90’s plays in the background, and various bottles of energy drinks stand empty around me. My eyes look wearily towards the floor, at the suitcase that is still half empty (half empty- not half full, although usually I am an optimist). There are piles of clothes, a few Harry Potter books, and my favorite stuffed elephant, spilling out and stacked around the giant open duffle. This is the bag that my life for the next four months will have to fit into; and of course, I'm trying to cram pretty much my whole room, closet, and kitchen into only a few square feet. It's not working out very well. Between multiple long breaks to check the Internet, raid the fridge, and make myself another pot of coffee, I throw a couple more sweaters in, find my favorite hat, take out a couple pairs of jeans. It is way too much. My suitcase is way too heavy. Yet it’s still not enough. Downsizing was never my strong point- as my mom often points out that I have too much stuff- and having to take only as much as I can carry myself is nearly impossible. This whole packing thing (ugh) is almost the last step in long painful process of preparing for studying abroad which started with thousands- or what seemed like thousands- of hours spent in the Study Abroad Office and on Google, trying to find the right program for me. Somewhere in France, a school where classes were in English, somewhere I could study art. Then I found Marchutz, somewhere in the South of France. I remember it being pretty there from when I traveled in a circle around the country of France in a bus about four or so years ago. I read about it, looked at the program it offered, and Googled images of the area. It looked amazing. Okay, I had to go there. I filled out the application, sent it in, and was accepted (YAY!). I renewed my passport (which was honestly the worst part of the whole process- Canadian passports are so strict about the pictures and it took me three tries to finally take a picture they would accept). I went through the Campus France and visa process, terrified the whole time that it somehow wouldn’t work. Then I got the message that all I needed to do was to visit the French Consulate in Chicago. I booked my Megabus tickets and- only a few hours after my last exam for the semester- set out toward the French Consulate. 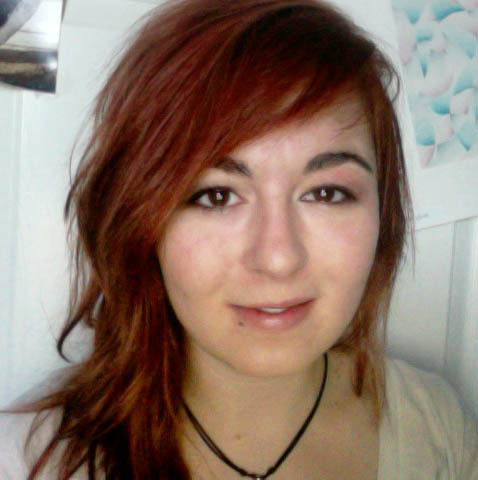 Running on about two hours of sleep and a Grande Starbucks Coffee, I had my visa appointment. The lady behind the glass took my forms; bank statement, passport, Campus France stuff, acceptance letter, and studied them carefully. “Alright, you are good to go.” She informed me that my visa would arrive in about ten days. And it did. On Christmas Eve, I drove to the Post Office, and nervously fiddled with my keys as the man behind the counter went to the back room to fetch my giant envelope. Even before I sat back down in the warmth of my tiny blue car, I had ripped the seal open. There it was. My visa. I was really going to France. I may have screamed a little bit, like a preteen girl at a Justin Bieber concert, as I drove back home. It was happening. It was really happening. Now it is almost here. Only a few days and an unpacked suitcase stand between me and my departure. I throw another jacket into the suitcase then stand up. I’m sick of packing for today. Oh well. I’ll get it done. And no matter what, this semester is definitely going to be amazing.